Volume above optimal levels can be annoying. Smart Volume Control+ app for Android gives you total control over all the volumes in your phone. It would come handy to those who wish to exercise fine control over their volume profiles. Smart Volume Control+ Android app can be downloaded for $2.49. Smart Volume Control+ app for Android gives you options to control your phone volume that you did not have before. As mentioned, the app let you fully customize any volume profile you got. And you got multiple ways to do it. For example, you can assign custom volume profiles to specific contacts. In other words, you can have any possible combination of ringers/vibrations to alert you of any specific contact in the address book. Further, you can have your phone auto adjust your profile depending on your location/time or a particular event on the calendar. For the latter, all you need to do is to add a profile tag to the title or description of the event. 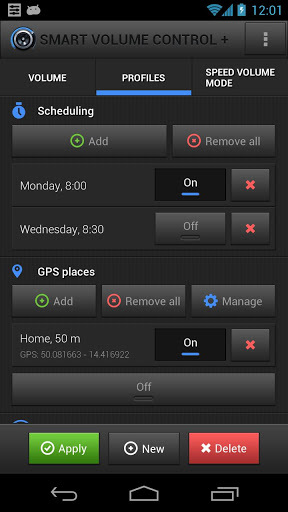 To add any location and have the application switch profiles according to your current location, just drag and drop the pin on the map, or let the application find your current location. An interesting feature of Android Smart Volume Control+ app is the speed volume mode. In this mode, the volume is adjusted based on the speed in which you’re traveling. This feature comes handy if you’re traveling by public transport (say) as it frees you from having to constantly readjust the volume manually. Another feature, headphone volume mode mutes all your phone volumes if the headphone gets unplugged so that you don’t have to worry about disturbing those around you. Once you plug your headphones in, the volume is restored. Similarly, in silent mode detection, you can have your phone go into silent mode for a set duration before restoring it back to the original volume profile. On the downside, in profiles by timers’ mode, you can set the phone to change profiles at a preset time. However, Smart Volume Control+ application does not have an option to change it back after the expiration of the set time period. Smart Volume Control+ app for Android beats all its immediate competitors hands down on the sheer weight of its multiple features. It virtually gives you total control over your phone’s volume profiles. The app is quite user friendly as well; picking/editing the schedules/modes is pretty straightforward. Of course there are few shortcomings. But otherwise it brings great utility value to the user. Verdict: Good one.